Some of the Rabbanim at Tuesday’s meeting in Manchester. Seen l.-r. Dayan Y Padwa, Rabbi A Gurwicz, Rabbi YC Horowitz, Rabbi Y Wreschner and Dayan C Ehrentreu shli’ta. 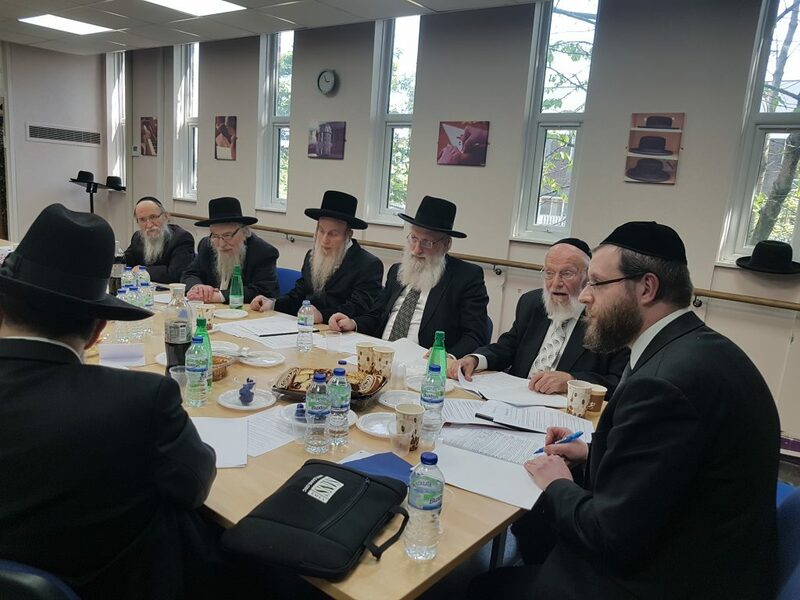 Senior Rabbanim from across chareidi kehillos in England convened in Manchester on Tuesday under the banner of Chinuch UK, to review the communal response to government education policies that conflict with Torah hashkafos. In the past few weeks, developments have taken place that concern the general kehillah. Firstly, the structure of Chinuch UK has been reinforced. As previously reported in Hamodia, it is absolutely imperative that the chareidi world speaks with a unified voice. The previous situation, in which each sector of Yiddishkeit, or each mossad made its own representation to the government was completely untenable. Besides confusing the issues each party raised with the authorities, it also ensured that each small faction by itself was insignificant. Chinuch UK can now justifiably claim to be the genuine mouthpiece for all of Torah Jewry. The Va’ad Harabbanim that oversees Chinuch UK includes leading Rabbanim and Roshei Yeshivos from every section of the communal chareidi spectrum. The dedicated askanim who have undertaken to defend the interests of Klal Yisrael against the recent unprecedented attacks have all great experience in working for the kehillah and represent every nusach of our rich tradition. Secondly, Chinuch UK has already begun engaging the authorities over the key issues that concern our kehillah. The askanim are working under the careful direction of the Va’ad Harabbanim, who give the askanim direction and set policy parameters. The Government is now fully aware that Chinuch UK is the authentic voice of the Orthodox Jewish population in the UK. Chinuch UK is entering into difficult long term negotiations, but is seeking uncompromised solid assurances to support any practical proposals. Thirdly, Chinuch UK has been inestimably strengthened by the torrent of emotions that has come from every individual within the community who has responded to the call of the Rabbanim during the last few months. The response to the Government Consultation was overwhelming. The outpouring of feelings has been manifest in the extraordinary numbers of people who have joined various atzaros tefillah that have taken place all over the country. This has created a wonderful sense of unity and achdus that has undoubtedly helped to give success to the hard work of the askanim. Tuesday’s meeting follows unprecedented attacks on chareidi chinuch, that have come to a head in recent weeks. The meeting is part of a concerted stepping up of community advocacy on education policy matters by Chinuch UK. Chinuch UK leaders believe that the British government is now listening to the community’s concerns. They believe that after the Department for Education received over 12,000 responses to its proposed new guidance for independent schools, and saw widely publicized images of thousands of Yidden gathered in tefillah across the country, that the government wants to see the conflict resolved. The Va’ad Harabbanim of Chinuch UK met to review the areas where the interpretation of the regulatory requirements brings Ofsted into conflict with chareidi schools and families, and to set out the Chinuch UK position. Clear advice was given by the Rabbanim in respect of the negotiations that are being opened up with the Department for Education and Ofsted, including in-depth discussions about the particular areas of concern to the community. The work of the askanim going forward will be clearly governed by this guidance. The Rabbanim resolved to meet again to continue their deliberations and to ensure that there is halachic oversight on all issues under discussion with the authorities. The Va’ad is comprised of two Rabbanim from each of England’s chareidi communities. The meeting was attended by Rav Yisroel Chaim Horowitz, Rav Gavriel Knopfler and Rabbi Yaakov Wreschner from Manchester; Harav Avrohom Gurwicz, the Gateshead Rosh Yeshivah and Harav Shraga Feivel Zimmerman, the Gateshead Rav; Dayan Chanoch Ehrentreu and Rabbi Yisroel Meir Greenberg from North West London, and Dayan Yosef Padwa from Stamford Hill. Rav Zev Feldman and Harav Ephraim Padwa, the Ga’avad of Kedassia, were unable to attend. Chinuch UK would like to reach an understanding with the Department of Education and Ofsted about how teachings on matters such as British values and equalities can be delivered in a way that is consistent with Torah hashkafos. Inspections in Manchester and Gateshead demonstrate that this can be done. They caution that a resolution is some way off, though Tuesday’s meeting was an important step on the journey. Credit for any success must be given to all the members of the kehillah who have added their voice to the cries of Klal Yisrael. Everyone is asked to carry on tefillos whether in public gatherings or within the privacy of our homes. The future of the chareidi community is at stake.